A typical Monday Session | HanseMUN e.V. 1.) Which country do I represent? First of all, every participant choses a country. If you already know beforehand, which country you would like to represent, please send an e-mail to info[at]hansemun.de, or reserve it on our facebook page. 2.) Roll Call – “Present” or “Present and voting”? The attendance of the countries is checked through the roll call at the beginning of every session. The Chair names every country one after the other. The representatives answer usually by stating “present”. If a delegate already knows that his or her government has a very certain opinion on the topic which is to be discussed, and will not allow any compromises, he or she may also answer “present and voting”. Consequently, it is forbidden to this delegate to abstain from voting on a draft resolution. Normally – at conferences – the chair primarily collects proposals on the discussion order of the topics on the Agenda. A “Motion to set the agenda” must be introduced to set this order. This is a procedural vote. However, at the Monday Sessions we have usually already set the topic of dispute. You will find it on our facebook page and may also prepare yourself a bit prior to the session. Every topic will be discussed during two Monday sessions. The first session gives all the countries the opportunity to clarify their positions whereas the second session focuses on writing a resolution. Generally spoken, there are two forms of debate in MUN-sessions: Formal Debate and Informal Debate. In order to focus the debate on a certain sub-topic, one can introduce a Moderated Caucus. 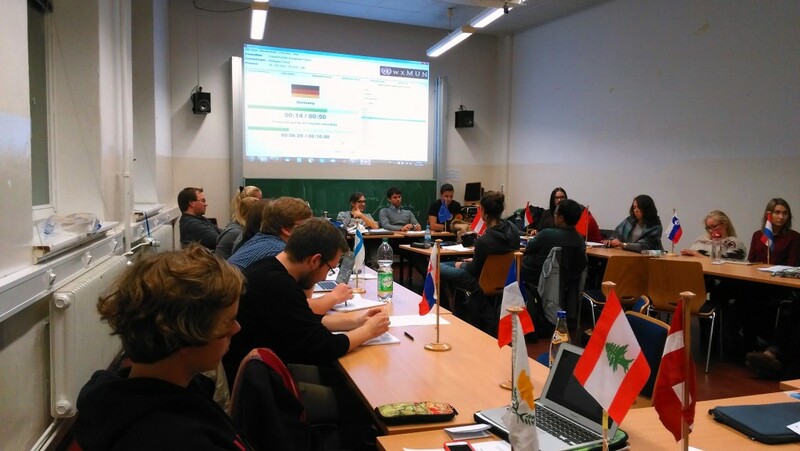 This could phrased as following: “The delegation of Germany moves for a moderated caucus on the topic ‚Smart Sanctions on Russia!‘, five minutes in total, individual speakers time 45 seconds.” Thus, the general speakers list would be suspended for five minutes and everyone who will be recognized by the Chair to speak, may state his/her countries position on the sub-topic for 45 seconds. Some times, an informal debate can provide a quicker solution. Delegates can get this by making a motion for a „_____ minute unmoderated caucus „.In this case, formal debate will be suspended. Delegates can exchange their views, can look for allies, can further discuss and most importantly can write working papers for resolutions. Upon these draft resolutions the body will later vote. Decisions of the committees are formulated in resolutions. In order to enable the committee to vote upon a resolution, delegates need to write so-called working papers. In these, they state which already existing regulations they approve and what solutions they suggest to solve the problem. Of course several different working papers can be developed in parallel. As soon as work on such a paper is finished and it is handed in to the chairs, it receives a new naming: Draft Resolution. For this, a certain number of supporters (“sponsors and signatories”) is needed. The difference is that sponsors unconditionally support the paper whereas signatories at least welcome the discussion on the points of the paper. It is left to the signatories in which way they will later vote upon it. A “motion to close debate” introduces voting procedure. Now the committee votes upon all the draft resolutions which have been handed in at that time. It is absolutely possible to vote upon several draft resolutions. As with the motions, voting is done through raising hands/placards. These votes are called “substantial votes”. Anybody who has during the initial role call stated to be “present” may vote “Yes”, “No” or “Abstention”. Countries being “Present and Voting” again must not abstain. All the draft resolutions which gain a majority will be passed. It is indeed not unusual that several resolutions are passed on the same topic. In the real UN, this happens regularly. After long debates everybody is always thirsty. That is why we always end the evening in one of the bars in close proximity to Campus. All the new and old “MUNers” are invited to join and thus get to know each other also outside the formal sessions!